1. Revenue has fallen sharply, with no rebound in sight. The 2012 and 2013 tax cuts led to a $688 million drop (10.8 percent) in overall revenue in FY 2014, the first full fiscal year in which the tax cuts were in effect. The tax cuts did not produce anything magical. Revenue did not replenish itself. The economy did not grow any faster than normal. Rather, the new estimate predicts a stagnant revenue stream of about $5.7 billion through FY 2017. 2. The revised revenue estimate may not be low enough yet. Corporate income tax receipts, sales tax receipts, and severance tax receipts underperformed expectations in the first nine months of FY 2015. So, the estimators revised the forecast for those revenue sources downward. However, individual income tax receipts have trailed last year’s low pace, but the estimators made no change to their previous prediction that income tax receipts would grow slightly in FY 2015. During April, May, and June, income tax receipts must be $147 million higher than that same period last year in order to meet the estimate. That may happen — but it may be too optimistic. Watch closely, because Kansas has very little flexibility left to absorb a revenue shortfall in the last three months of FY 2015. 3. The budget gap became larger for FY 2016. The general fund budget passed by the Kansas Senate sets expenditures at $6.478 billion in FY 2016, but the revised revenue estimate now predicts overall revenue of only $5.713 billion — a gap of $765 million. Undoubtedly, a portion of that gap will be filled by transferring money from the highway fund and doing some other one-time financial maneuvers still available to lawmakers. However, with the general fund bank account empty, a large portion of the gap must be filled by passing tax increases, or by implementing even more spending cuts. The budget that lawmakers are currently working with in a conference committee is far from funded. Even after converting school finance to a block grant system, state expenses are $6.5 billion and growing, while the revised revenue estimate shows a revenue stream that is basically flat at about $5.7 billion. To be financially healthy, the state needs $6.478 billion in ongoing revenue in order to spend $6.478 billion. If tax policy had been left alone three years ago, Kansas would now have enough income to fund the budget being considered. Instead, deep tax cuts have reduced the state’s revenue stream far below the amount needed to responsibly fund education and other key programs. 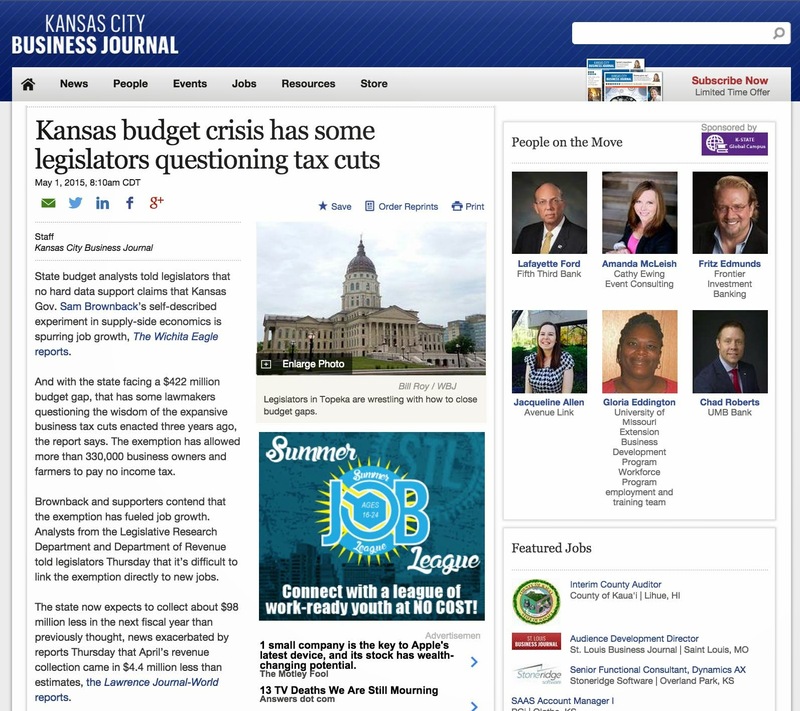 — This post first appeared on the Kansas Center for Economic Growth website on April 24.